I have a carefully used folding Freerider Luggie Mobilty Travel Scooter for sale that has only been used two times indoors. This folding mobility scooter is very compact and rugged with wonderful turning radius and stability perfect for crowded airports. It is perfect for airplane travel or any kind of travel including train, bus, car or cruise ship! The Luggie is SO easy to fold up without using any tools. There is no need to get on your hands and knees to take the scooter apart or reassemble it. The record time for unfolding a Luggie is only 23 seconds! When it's folded, it rolls along similar to a rolling suitcase. 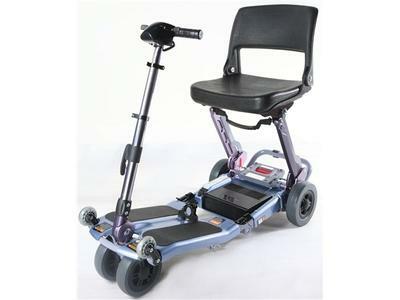 Anyone with a disability will appreciate the simplicity, reliability and ease of operation of this handy folding travel scooter. scooters like this and what they are selling for and you will see that this is a really good deal! If you have any questions regarding this barely used Luggie mobility scooter or if you would like to make an appointment to see it in person or make payment and pick up you can do so using the space below that has been provided by GoGoCycles Used Scooters for Sale and PLEASE do not neglect to include your contact information in your email or to provide a phone number or email address so that I can respond with answers to your questions or set up an appointment as quickly as possible. In my opinion there is not a better deal on a used scooter for sale as this one on Craigslist or Ebay! GoGoCycles would also encourage our biker friends to write a review of the Folding Freerider Luggie Mobilty Travel Scooter for Sale or share any thoughts and/or opinions to make potential buyers aware of any problems that are commonly associated with this brand or to highlight its positive features and help our visitors make informed decisions. The model has a retail price of over $2600. I am selling this one for $1400 (including shipping! If you're interest, act fast and don't forget to mention that you found this ad on GoGoCycles Motorcycle Classifieds www.gogocycles.com using the comments forms located on this page! I am in Western Massachusetts. Where are you located? I'd like to see and test drive it. Have you sold the Luggi? What is included in this scooter?